We introduce you to our colleague Ruth. 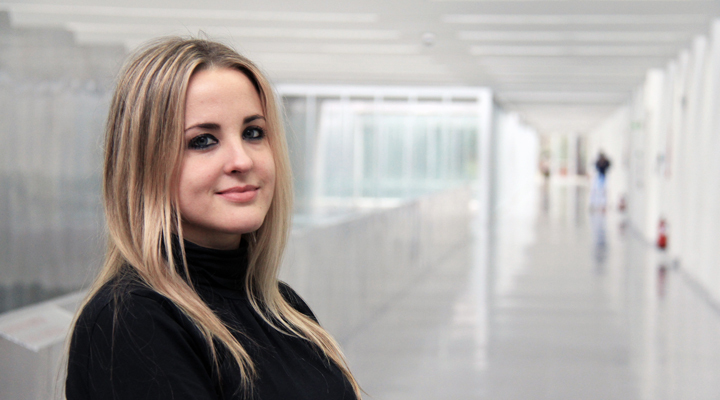 Pets, yoga and video games lover, this Computer Engineer is one of the most recent and relevant members of the team since she joined the EU Programmes team at Gradiant in 2017. Our colleague is from Vigo and she loves to go for a walk on the local beaches with her pet. She loves to travel and find new places. That’s the reason she analyzes proposal to international collaboration in ICT’s research projects every day at work. What did you want to do when you were younger? I would have liked to become a vet because I always had a true passion for animals. Why did you choose technology for your future? One of my hobbies since I was a little girl has been computer’s world. In contrast to what people believe, I think technology is creative. Technology allows us to be able to have ideas from nothing and then put them into a practice and this is one of the great changes that marks the evolution in society. Where did you plan to do your career? Why? In Salamanca, because I wanted to have the experience to live outside of Galicia. Salamanca is a very beautiful city, with a great atmosphere and you can go for a walk everywhere you want. I was clear that the university years I would like to live as the best time, and they were. In EU Programmes team at Gradiant. I like the new challenges to be faced and all the new things that I still have to learn, especially in terms of management. It is very different from what I used to do in my previous jobs, where I developed a technical role. So I try to absorb the maximum of my colleagues I work with every day. Who is your feminine reference in tech world? I would say that María Fanjul. She is a young woman, in her early thirties, entrepreneur and with a lot of ambition, who has managed, among other things, to be the founder of ‘entradas.com’ and currently the director of e-commerce for Inditex. What would you say to future technologists? I would say them to always value the dignity of people against any other value in the development of their work. The ideas and actions of technologists affect human behaviour and what will be a new way of creating and directing a global society. © Copyright Gradiant 2017. Todos los derechos reservados.